America’s top Marine said Wednesday that after 17 years of fighting in the Middle East, the corps is increasingly focused on the potential wars of the future. Neller spoke to community and civic leaders at the San Diego Military Advisory Council‘s monthly breakfast at the Navy Mine & Anti-Submarine Warfare Base on Pt. Loma. Recruiting: The corps is in a “good place” for attaining its goal of 186,000 active-duty Marines. 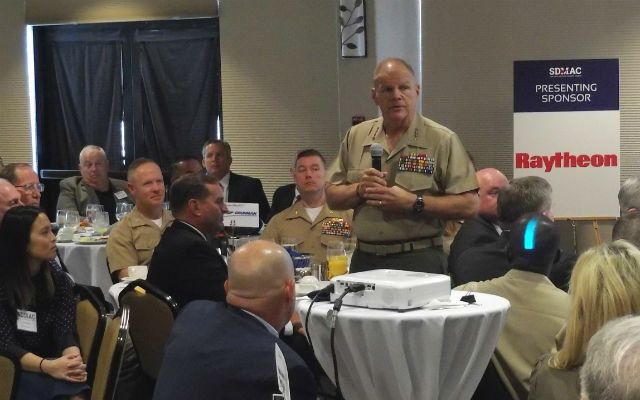 Neller told the group, many of whom represent the defense industry, that despite improvements in weapons technology, the cornerstone of the Marine Corps’ effectiveness remains the individual Marine.